Part of the national fascination with Chaplin’s new job was that the company had lured him with the then-astronomical offer of $1250 a week, plus a $10,000 signing bonus. That’s more than 1.75 million for the year in today’s dollars. Keystone, by contrast, which had been paying him $175 a week, offered to raise his salary to a paltry $500. Even with the promise of incremental raises to follow, it was no contest. 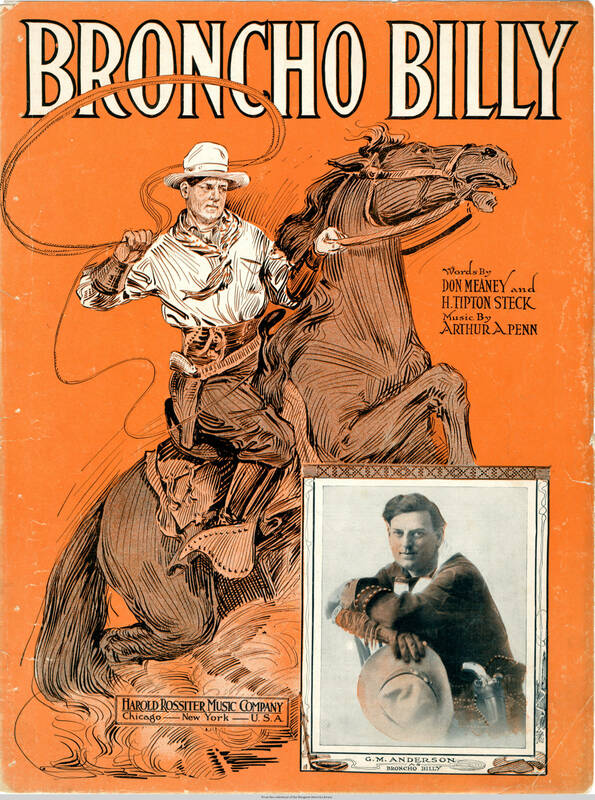 Essanay (the name derives from the initials of its founders, Spoor and Anderson) had a studio in Niles, California, where Anderson, America’s first cowboy star, had already cranked out hundreds of profitable “Broncho Billy” westerns. After he signed with the company Chaplin traveled to Niles from Los Angeles to begin shooting. But he found the area too remote and the working and living conditions too primitive. He was particularly appalled to discover that Anderson, a millionaire who drove in a chauffeured limousine, lived in a crude bungalow. It had indoor plumbing, but the toilet was broken. Chaplin wanted no part of this rustic lifestyle, so a few days before Christmas Anderson accompanied him on a train to the company’s Chicago studio (the building still exists today as part of St. Augustine College). Anderson maintained an apartment in Chicago, and invited Chaplin to be his guest there. They were greeted at the train station by Anderson’s wife Mollie, who brought them back to the apartment. Chaplin was relieved to find it spacious and well appointed. Years later Mollie still recalled the “radiant” expression on his face as he took in their lavishly decorated Christmas tree and beautiful baby girl. “He kept exclaiming: ‘A Christmas tree, a baby, a Christmas tree! It’s wonderful!’” Mollie immediately brought him into the family fold by treating him like an errant younger brother, ordering him to comb his unruly hair in the morning and buying him a whole new wardrobe—a necessity, since Chaplin had traveled without luggage, or even an overcoat to shield himself from Chicago’s notoriously icy winter winds. He was delighted with the attention, and relished spending the holidays with Anderson’s charming and accommodating little family. 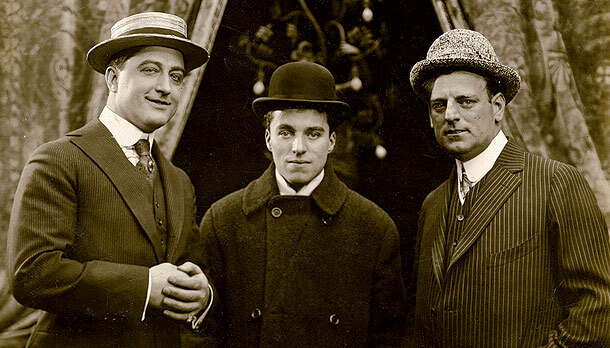 Chaplin, in his new overcoat, flanked by Francis X. Bushman, left, one of Essanay’s biggest stars, and G.M. Anderson shortly after arriving in Chicago in late December, 1914. While Chaplin liked Anderson, he didn’t feel the same way about Spoor, who was conspicuous by his absence during those frenzied first weeks. In fact, Spoor had been dismayed when his partner signed the comedian without consulting him, and for a salary far exceeding the $75 a week he normally paid his leading comics. But rather than face the situation he simply left town, without authorizing either Chaplin’s salary or the promised signing bonus. It was only weeks later, after learning that Chaplin’s first film was drawing more pre-orders than any film in the company’s history, that Spoor reappeared, all smiles, along with the deferred payments. The studio culture also proved to be a problem. Essanay’s Chicago studio was run like a factory, as indicated by its full name, the Essanay Film Manufacturing Company. 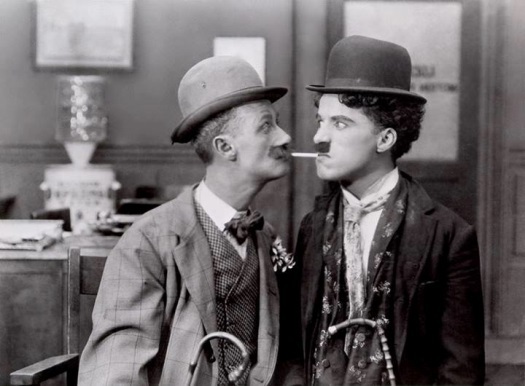 When Anderson left after the New Year and Chaplin showed up to begin work, he was ordered by the studio manager to report to the scenario department for a script. He had to assert his intention to write and direct his own films, just as he had done at Keystone. But at Keystone he had found the freewheeling atmosphere stimulating, and he very much liked and respected studio head Mack Sennett and his fellow actors. Suddenly he found himself fighting an entrenched bureaucracy. Alone, unpaid, and working in a hostile environment, he must have wondered whether signing with the company had been a terrible mistake. The reporters who gathered on the set that first shooting day had no inkling that all this drama was playing out behind the scenes. They just stood there gawking at him, along with all the studio personnel who had come down to check him out. Chaplin was on the spot, and he had to do something to live up to his advance billing and enormous salary. Chaplin and Ben Turpin in His New Job. So after limbering up with that clog dance he got right to work, brilliantly channeling all the pressures and irritations into a bold and ironic joke: in his first film for the company he would play an incompetent who bluffs his way into a movie studio and causes chaos. This allowed him to lampoon the very people who were bedeviling him, and, more importantly, use the sets and props at hand without wasting a moment. 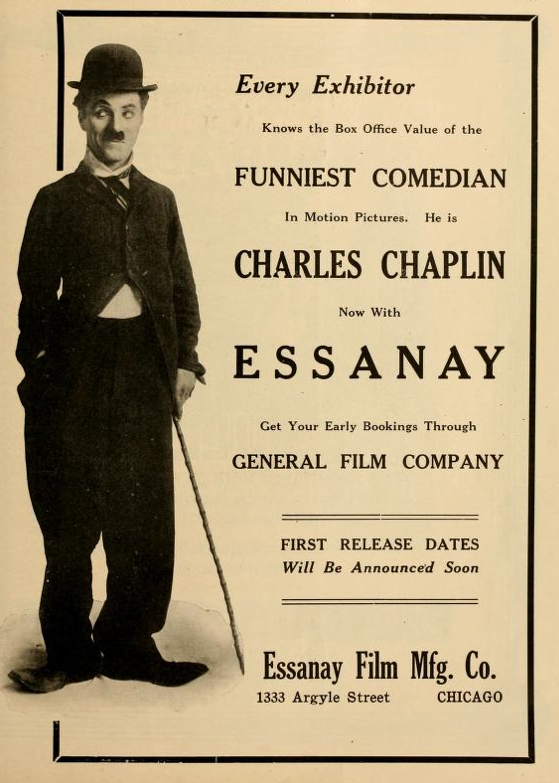 He gave Essanay what it wanted, a new Chaplin comedy in only two weeks’ time. He gave movie audiences what they wanted as well, flirting outrageously with every woman in sight, fighting with all the men, and becoming so love-struck by his leading lady that he fails to notice he’s ripped off the train of her dress and is using it to dry his tears and wipe his nose. The public’s fascination with Chaplin grew exponentially throughout 1915, and the following year the Mutual Film Company would lure him away with the even more astounding financial offer of $10,000 a week plus a $150,000 signing bonus— over fifteen million a year in today’s money. This made Chaplin the highest paid actor—indeed, the highest paid salaried employee of any kind—in the world, and the news made headlines across the country. He was under more pressure than ever to be funny. Knowing the circumstances of its creation makes His New Job all the more impressive, but even without that knowledge the film remains engrossing. Chaplin’s inspiration, though it flags now and then, mostly blazes brightly. Critics called the film “killingly funny” and “the funniest comedy ever filmed,” and the public received it rapturously. After their rough start Spoor did his best to ingratiate himself, but the die was cast. Chaplin disliked Spoor, the studio, and the weather, and once the film was completed he returned to sunny California to fulfill the rest of his contract. But during his brief time in the Windy City he warmed up that cold Midwestern winter, leaving us with an indelible record of what it was like to be a comic genius making a movie, against all odds, in 1915. Dan Kamin trained Robert Downey, Jr. for his Oscar-nominated performance in Chaplin and created Johnny Depp’s comedy moves for Benny and Joon. He also played the wooden Indian that came to life in the cult horror classic Creepshow 2. An internationally acclaimed mime and physical comedian himself, he is the author of The Comedy of Charlie Chaplin: Artistry in Motion. You can see Dan’s antics at www.dankamin.com. Gary N. Keller and Janelle Vreeland, co-founders of ChicagoNitrate.com, instigated and contributed to this article. They have been instrumental in the preservation effort for Chicago as a birthplace of film, the history of Uptown as a center for Chicago’s silent film industry, and the restoration and reuse of Essanay Studios. Chaplin’s Essanay Comedies presents 15 newly-restored films on Blu-ray/DVD. Order yours today. For more exclusive essays like this one, plus film preservation news and special discounts, sign up for the Flicker Alley Newsletter. Victor Eubanks, “The Funniest Man on the Screen,” Motion Picture Magazine, March, 1915. Charles A. McGuirk, “Chaplinitis,” Motion Picture Magazine, July and August, 1915. Quoted in William K. Grisham, “Those Marvelous Men and Their Movie Machines,” Chicago Tribune Magazine, December 7, 1969. Motography, January 23, 1915. The two were fond of each other off the dance floor as well. During Chaplin’s year with the company they socialized, performed in public together several more times, and even appeared in each other’s films. Anderson did a cameo as a boxing match spectator in Chaplin’s third Essanay, The Champion, and a few months later Chaplin returned the favor by making a rather incongruous comic appearance in Anderson’s His Regeneration. Chaplin also paid Anderson the compliment of borrowing the melodramatic plot of His Regeneration for one of his best Essanay comedies, Police. Steck was quoted by Essanay actor Edward Arnold in Arnold’s autobiography Lorenzo Goes to Hollywood (Liverwright, NY, 1940), and quoted in turn in David Kiehn’s invaluable Broncho Billy and the Essanay Film Company (Farewell Books, Berkeley, CA, 2003). Gene Morgan, quoted by David Robinson in Chaplin: His Life and Art (Penguin Books, London, 2001).